My favorite food spot is in Manchester. It’s a little unassuming spot tucked in the back corner of a stripmall. 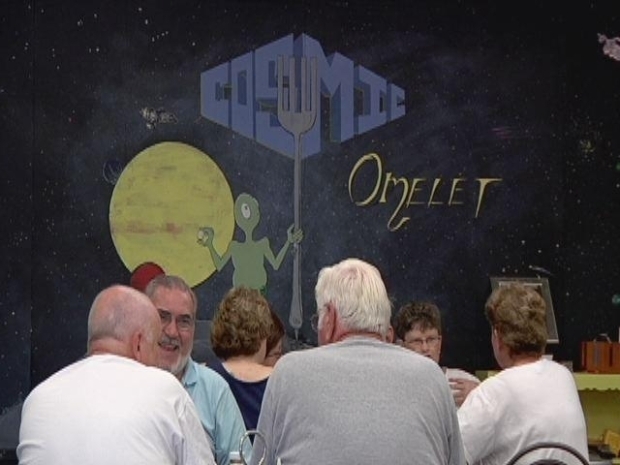 Cosmic Omelet is out of this world. But don't be fooled by the alien on the wall. The staff is down to earth. “Tracy is wonderful, Max is a great cook, Tiff is one of the best waitresses around,” said restaurant regular Rob Kaba, who lives down the road. I enjoy the funky, laid back vibe. The menu is creative and, just like the joint itself, a little quirky. Yvonne Nava's favorite place to eat. Usually I order the same thing. The Jay's Omelet. But this time around, I wanted to try something a little different. There is a plate called “For the Brave and the Curious.” It’s a buttered bagel, with peanut butter and bacon. Many of the dishes are named after and designed by staff or long standing customers. If you spot the word “cosmic” anywhere in the menu, it is code for with cream cheese. Hands down, the grub is great, the atmosphere is nice and the people you meet are so friendly. “I am a foodie, a fat kid at heart, so good eats is where I like to be,” Kaba said. “It’s like Cheers, only in Manchester, Everyone knows your name,” Ibby Cummings said. Every Tuesday, she and her friends meet up for breakfast. Miss other segments in our "Feasting" series. You can see them here.